With summer at it's end, I'm using the last of the zucchini from the garden. For some reason we didn't have as much of it this year, which is really a shame because I've come to enjoy finding recipes to cook and bake with it. 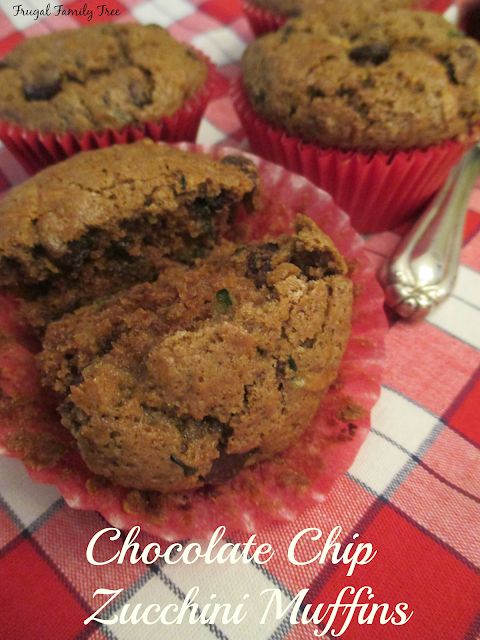 This recipe for these muffins is so yummy that my grandchildren gobbled them up even when they knew they contained zucchini. This is a big deal because they are always wary of trying things that their mom or I try to sneak veggies into. Enjoy these muffins with a big cup of coffee or tea. I had one that was leftover for breakfast. I warmed it up in the microwave with a little bit of butter and it was heavenly. A perfect start to my day. Preheat oven to 350 degrees. Fill a muffin pan with 12 paper liners. Whisk together flour, cocoa powder, cinnamon, baking soda, baking powder, and salt. In a large bowl, beat together sugar, oil, egg, and vanilla with an electric hand mixer until it is thick and creamy, 2-3 minutes. At low speed, mix in the flour until just incorporated. Stir in zucchini and chocolate chips. Divide equally among muffin liners and bake 25-30 minutes. Cool muffins on baking rack.